Thirumoorthy, N., Sunder, A., Panayapan, L., Kumar, K., Kumar, M., Ganesh, G., Pandian, S., Chatterjee, M. (2010). Expression of Metallothionein, P53 and Antioxidant Enzymes by Selenium and Vitamin D3 during Diethyl Nitrosamine-Induced Rat Liver Preneoplasia. Iranian Journal of Pharmaceutical Sciences, 6(2), 115-124. N Thirumoorthy; A Shyam Sunder; L Panayapan; KT Manisenthil Kumar; M. Senthil Kumar; GNK Ganesh; Soundera Pandian; Malay Chatterjee. "Expression of Metallothionein, P53 and Antioxidant Enzymes by Selenium and Vitamin D3 during Diethyl Nitrosamine-Induced Rat Liver Preneoplasia". 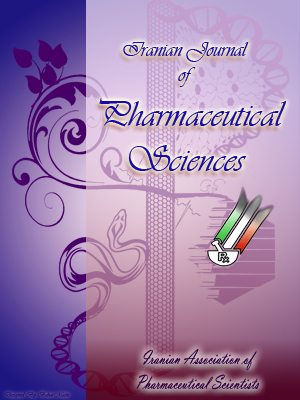 Iranian Journal of Pharmaceutical Sciences, 6, 2, 2010, 115-124. Thirumoorthy, N., Sunder, A., Panayapan, L., Kumar, K., Kumar, M., Ganesh, G., Pandian, S., Chatterjee, M. (2010). 'Expression of Metallothionein, P53 and Antioxidant Enzymes by Selenium and Vitamin D3 during Diethyl Nitrosamine-Induced Rat Liver Preneoplasia', Iranian Journal of Pharmaceutical Sciences, 6(2), pp. 115-124. Thirumoorthy, N., Sunder, A., Panayapan, L., Kumar, K., Kumar, M., Ganesh, G., Pandian, S., Chatterjee, M. Expression of Metallothionein, P53 and Antioxidant Enzymes by Selenium and Vitamin D3 during Diethyl Nitrosamine-Induced Rat Liver Preneoplasia. Iranian Journal of Pharmaceutical Sciences, 2010; 6(2): 115-124. Many studies have proved that the dietary micronutrient has an inhibitory effect against experimentally induced rat hepatocarcinogenesis. The present work is an attempt to understand combined effect of selenium (Se) and vitamin D3 (vit D3) on some potential protein expression markers of carcinogenesis, such as metallothionein (MT), P53 and antioxidant levels during diethyl nitrosamine (DEN) induced (200 mg/kg in 0.9% NaCl; IP) rat liv er preneoplasia. In a short term regimen combined supplementation of Se and vit D3 at a dose of 8 ppm in water and 0.3 μl/100μl in propylene glycol, respectively, suppressed the formation of DNA comets (28.40%), thereby indicating its non- genotoxicity at this particular dose. Se and vit D3 administration throughout the study reduced relative liver weight. Modular incidence were 22.7% when compared to the carcinogen control. However, treatment with Se and vit D3 showed significant expressions of MT and P53 which studied at four sequential time points. An increased immunopositive of P53 protein (1.3±0.56% p3 together treated rat liver with an elevated apoptotic labeling index (A1; p3 together mediated suppression of MT may be associated with induction of apoptosis. The results thus provide evidence for the first time in support of the potential role of combined supplementation of Se and vit D3 on induction of P53 apoptosis with concurrent suppression of MT in order to have an understanding. Regardless of the mechanism, based on the results reported in this study, both Se and vit D3 could be considered a potential cancer chemopreventive agents whose effect is presumably based on inhibition of growth of the neoplastic cells by coordinated regulations of different biochemical markers and enzymes studied herein. Nutrition rich food has traditionally been considered the major source of metabolic micronutrients which could play an interactive way to prevent the degenerative diseases including cancer. Vitamin D3 and selenium are highlighted in this work because of their physiological significance in cancer prevention. As the science of nutrition unfolds, a clearer understanding will emerge about how nutrients can modulate cancer risk through molecular interactions and how food might be changed by agronomic approaches. Nutrition and cancer research will move from an observational to a molecular approach as knowledge about genomics and new technologies surfaces. Nutritional genomics offers opportunities to credential nutrients, that is, to determine which specific nutrient related genetic and epigenetic changes bring about phenotypic changes that influence of cancer risk . Our cells have built-in, powerful mechanisms to remove or destroy toxic substances, inhibit DNA damage, repair broken DNA cross-links and remove cells that are injured or abnormal before they become cancerous. In recent years, the term phytochemical has been used to refer the thousands of newly-discovered nutrients supplied by plants that in addition to vitamins and minerals which are necessary for maximal immune system protection and for the promotion of cellular detoxification and repair. Populations that have a high intake of natural, unrefined plant foods such as fruits, vegetables, seeds, nuts, and beans always have a low incidence of cancer, proportional to the intake of those phytochemical-rich plant foods . In an effort to understand the biology of this intriguing tumours, various biomarkers such as oncogene, tumors suppressor gene, waf 1 protein, proliferating cell nuclear antigen (PCNA), telomerase, micro-satellite markers and cytogenetic changes have been examined. One biomarker which has recently shown to be expressed in various human tumours but still less reported in carcinoma is metallothionein (MT) . Metallothioneins were discovered in 1957 in kidney cells [2, 3] and identified as low molecular weight and sulphoydryl rich proteins. MTs play a homeostatic role in the control and detoxification of the heavy metals. The tumor suppressor protein P53 is one of the most frequently activated proteins in apoptosis. P53 is able to respond to difficult cellular stresses, such as DNA damage, hypoxia, and oxidative stress. As a critical cellular mediator, P53 has a direct role in maintaining the integrity of the genome. Symonds and his co-worker explained that the loss of P53 activity has been associated with tumor progression and unfavorable prognosis of the tumor . This work is an attempt to evidence and characterize the metallothionein and association of various surrogate endpoints and precise quantifications of the magnitude in the DEN induced hepatocarcinogenesis. Male Sprague-Dawley rats obtained from the Indian Institution of Chemical Biology (IICB), Kolkata, India, weighing 80-100 g at the beginning of the experiment were acclimatized to standard lab conditions (temp 24±1°C, relative humidity 55±5% and a 12 h photoperiod) in Tarson cages (four to five rats per cage) for 1 week before the commencement of the experiment. During the entire period of study, the rats were supplied with a semi-purified basal diet (Lipton, India) and water ad libitum. The recommendations of Jadavpur University Institutional Animal Ethics Committee for the purpose of control and supervision of experimental animals (CPCSEA Registered Number 0367/01/C/CPCSEA India) for the care and use of lab animals were strictly followed throughout the study. • Values are mean±SD of ten animals. • Means followed by a common superscript letters are not significant at 1% and 5% level by using DMRT- ANOVA method. • Statistical significance symbol: P < 0.05 and - **P < 0.01. Significance identification – The difference between normal and compared group value is more than the CD value is considered as significant. To investigate the chemopreventive efficacy of selenium and vitamin D3 when given in combination against chemical hepa-tocarcinogenesis, the rats were divided into eight experimental groups each containing ten models (Figure 3). Group ‘A’ rats were the carcinogen (DEN) control while group ‘B’ rats served as the untreated normal control, and group ‘C’ rats received selenium alone (Wockhard, India) at a dose of 8 ppm in drinking water and given ad libitum as refered by Bishayee and Chatterjee,1995 . Group ‘C’ rats served as the respective selenium as seleno methionine at the dose of 8 ppm in water and group ‘D’ were control of selenium. Group ‘E’ received only vitamin D3 as 1-a,25-dihydroxyl vitamin D3 (Cadila pharmaceutical Ltd. India) at a concentration of 0.3 ml/100 ml in propylene glycol per os twice a week. Group ‘F’ rats served as the Vitamin control. Group ‘G’ rats received both vitamin D3 and selenium at the same given dose, while group ‘H’ rats served as the respective control of group ‘G’. Hepatocarcinogenesis was initiated by single intraperitoneal (i.p) injection of diethyl nitrosamine (DEN) at a dose of 200 m g/kg body weight in 0.9% NaCl solution at week four in the groups A, C, E and G. Treatment of selenium and vitamin D3 groups alone or both started at 4 weeks before the initiation with DEN. The experiment was continued for 20 weeks, 24, and 32 weeks, (16 weeks after DEN administration). All the rats were sacrificed after 20 weeks. All animals were maintained with the basal diet throughout the experimental period. The rat liver is one of the most extensively studied models of carcinogenesis and multiple formats have been described for the analysis of cancer development in this organ. After the rats were sacrificed, their livers were promptly excised, blotted, weighed, dried and then examined macroscopically for gross, visible hyperplasic nodules (HNs). The nodules with approximated spheres were measured in two perpendicular directions to the nearest mm to obtain an average diameter of each nodule. The HNs were categorized into three groups according to their diameter ( viz., /3, < 3 to /1 and [1mm) as described . For histological studies, longitudinally cut blocks were taken from the left, right-median and right-anterior lobes and the samples were fixed immediately in 10% buffered formalin to prevent deformation. At least three slices per liver were embedded in low melting point paraffin. Sections of 5 mm thick were de-paraffinised in xylene and rehydrated through 100%, 90% and 70% alcohol. Five contiguous sections were made from each liver slice for routine histo-pathological evaluation by hematoxylin and eosin staining. Specific hepatocellular lesions observed in hematoxylin and eosin staining were recognized by light microscopy (Adcon, Model No. 5591) according to published criteria of Bannasch, 1976; Stewart 1980 . The histological slides were coded so that the particular treatment was unfamiliar to the individual performing these studies. Table 2: Two-way DMRT -ANOVA table for effect of selenium and/or vitamin D3 on metallothionein immunoreactivity of DEN challenged rat liver at 16, 24 and 32 weeks. Values are mean ±SD of ten animals. • CD-Critical difference value and it was determined commonly for (Two ways) between the groups and within the groups. Significance identification. The difference between normal and compared group value is more than the CD value is considered as significant. The animals were sacrificed with proper anesthesia. Liver of either lobe were excised, minced and homogenized with ice-cold 1.15% (w/v) KCl solution (pH 7.4) in a Teflon coated glass homogenizer to make a 10% (w/v) homogenate. The cytosolic fraction was prepared by differential centrifugation. First the homogenate was centrifuged at 9,000 g for 30 min. The resultant supernatant fraction was re centrifuged at 105,000 g (33,000 rpm) for 90 min. in a Sorval–OTD-50B Ultracen-trifuge. Supernatant of the 105,000 g represented the cytosolic fraction and was stored at -20 °C until further use. The pellet was re-suspended in homogenized buffer that served as the microsomal fraction. All operations were done at 0-4 °C. The enzymatic activity of g-glutamyl transpeptidase (GGT) in cytosol fraction was measured according to an adaption of the method of Tata and Meister (1974). The cytosolic fraction was pre-incubated with 1% deoxycholic acid at 25 °C for 15 min. The standard reaction mixture (1 ml) contained 0.05 M Tris-HCl buffer (pH 8.0), 75 mM NaCl, 20 mM glycylglycine (Sigma) (pH 8.0), 2.5 mM L-y-glutamyl–nitroanilide (Sigma, USA) as the substrate and a suitable amount of the enzyme preparation. The reaction mixture was incubated at 37 °C for 5 min and the reaction was initiated by the addition of the substrate. The rate of release of p-nitroaniline was measured at 410 nm in a Hitachi U-2000 spectrophotometer. The activity of cytosolic glutathione S-transferase (GST) was determined by an adoption of the method of Habig et al. 1974 using 1-chloro-2,4-dinitrobenzene (CDNB) and GSH (Sigma) as substrates. The reaction mixture (1 ml) consists of 0.1 M phosphate buffer (pH 6.5), 1 mM GSH, 1 mM CDNB and a suitable amount of cytosol (1.2 to 1.6 mg protein/ml). The reaction mixture was incubated at 37 °C and the reaction was initiated by the addition of the CDNB. The increase in optical density at 340 nm was measured spectrophotometri-cally with a temperature controlled cell compartment. The level of cytosolic GSH was quantified by the method of Ellman (1959). For this, 1 ml of cytosolic was mixed with 1 ml of 4% 5-sulphosalicylic acid and the mixture was centrifuged at 1,500 g for 15 min., the supernatant was allowed to react with 0.1 mM 5,5’-dithio-bis (2-nitrobenzoic acid) (Sigma Chemical Co, St. Louis, MO. USA). The solution was kept at room temperature for 10 min and read at 412 nm by a Hitachi U-2000 spectrophotometer. The total cytochrome P450 (Cyt. P-450) in the microsomal fraction were measured by using Na-dithionate as a chemical reductant. The extinction coefficient E at 450 to 490 nm=91 cm-1 for conventional difference spectroscopy was used as originally described by Omura and Sato (1964). Total cytosolic and microsomal protein concentrations were estimated by the method of Lowry et al. (1951) using bovine serum albumin as a standard. Each enzyme assay and biochemical estimations were performed in triplicate from every treated and control groups under experimental condition. Immuno-histochemical detection of MT protein in cold acetone-fixed paraffin embedded liver sections was performed by the streptavidin-avidin-biotin-immuno peroxidase complex method . Briefly, 5 mm thin sections on poly L-lysine-coated slides were deparaffinized and rehydrated. Endogenous peroxidase activity was blocked with 1% H2O 2 in 0.1 M Tris-NaCl (pH 7.6) for 30 min. After incubation with 5% normal goat serum for 1 hour at 37 °C, sections were incubated overnight at 4 °C with the primary antibody rabbit anti-rat MT- 1 in 1% BSA using 1:50 dilution, (a kind gift from Prof. Jim Geiser, University of Kansas, USA). Sections were then incubated with a biotinylated secondary antibody goat anti-rabbit IgG (Sigma) for 30 min., at 37 °C with 1:200 dilutions. This was followed by incubation with streptavidin peroxidase (1:100) for 1 h and subsequent chromogen development with 0.5% of 3,3’-diaminobenzedrine tetrahy-drochloride (DAB) and 0.33% H2O2 in 0.5 M Tris-NaCl as the substrate. The sections were then counterstained with Harris haematoxylin (H&E), dehydrated and mounted and served as positive control. Negative control was prepared following all the above mentioned steps omitting the primary antibody. Figure 1: Thin section of the rat liver hepatocellular architecture after continuous supplementation of selenium and/or vitamin D3 for 20 weeks (H&E×100), Group B- Showing normal hepatocellular architecture, Group G- Hepatocellular architecture of supplementation of selenium and vitamin D3 , Group A - Abnormal hepatocellular architecture with plenty of basophilic cells scattered in the cytoplasm after a single i.p. injection of DEN, Group A - Showing abnormal hepatocellular architecture with prominent preneoplastic focal lesion around the portal vein after a single i.p. injection of DEN, Group A- After a single i.p. injection of DEN, Group B- Showing normal control, Group G- After supplementation of selenium and vitamin D3. MT immune-staining was considered positive when the nuclei and cytoplasm of the hepatocytes were stained prominently (purplish brown/reddish brown). MT immuno reactivity was expressed as percentage of immuno positive cells. A total of 10 high power fields were randomly chosen. The number of positive cells was determined in relation to the total number of cells in the field. P53 immunolabeling, antigen retrieval was facilitated by heating the sections in citrate buffer (pH 6.0) for 20 min. before quenching of endogenous peroxidase. After incubation in normal goat serum, section was separately incubated with the primary antibody sheep anti-P53 antibody (sigma) at 1:300 dilutions. The rest of the steps were similar to the protocol for MT immune-histochemistry. There was no appreciable change in food consumption observed among different groups of rats. Daily intake of water was measured with measuring cylinder and it was found that rats took on an average of 8-10 ml of water per day per rat. Significant increases in body weight in all Se and vit D3 treated groups were observed. The liver weights did not vary predominantly among different rat groups. Furthermore, the relative liver weight of DEN control group (group A) was found to increase compared to that of normal untreated control (group B). The mean relative liver weight was found to be decreased significantly (p3, compared to group A ,carcinogen control, rats. In this study, it was observed that the weight of rats which were treated with DEN were slightly lower than the final body weight of normal control group. Treatment with both Se and vitamin D3 in combination increased the final body weights and decreased the relative liver weight. Figure 2: Light micrographs of tissue section from rat liver after 32 weeks showing immunostaining of metallothionein with rabbit anti-rat MT antibody and DAB.Arrow head ↑ indicates intense immuno staining of MT protein with prominent focal expression and clusters of MT positive foci. Moreover, treatment with both Se and vit D3 reduced the larger nodules (/3mm) most effectively (22.7%) than Se (24.4%) and vit D3 (36.5%) alone treated rats (group ‘C’ and ‘E’) when compared to group ‘A’ (47.1%). Analysis of data of nodule multiplicity showed that Se and vit D3 when supplemented together additively inhibited the nodule multiplicity because the interaction effect between them. On the contrary, gross structural alterations were seen in group ‘A’ rats (DEN control) with predominantly basophilic, eosinophilic and clear cell foci (Figure 1). Extensive vacuolation was observed in the cytoplasm encircling the nucleus with masses of acidophilic materials. Some nuclei in the cells were large and hyperchromatic with prominent and centrally located nucleoli (Figure 2.4). Phenotypic altered hepatocytes populations in the form of altered liver cell foci and nodules in varying extent were noticeable throughout the hepatic parenchyma of all groups treated with DEN, i.e. groups A, C, E and G. The cellular architecture of hepatic lobules in group G rats those received both Se and vit D3 in combination for 32 weeks seemed to be almost comparable to normal control. This elicited the maximum protection of both selenium and vitamin D3 for the entire period of study (group G) against DEN-induced hepatocarcinogenesis, which was reflected in the almost normal hepatic cellular architecture. Figure 3: Metallothionein gene expressions protocol design. Treatment with Se offered 32.86%, while vit D3 resulted in 26.29% inhibition in the GGT activity over and the normal rats. Treatment with Se offered a more (42.25%) inhibition in treatment groups. In contrast, Se and vit D3 alone or with combination, was found to reduce GST activity at marginal levels (statistically insignificant) when compared to normal group (B). The continuous treatment of Sel in group C, vit D3 in group E or their combinations in group G for 32 weeks resulted in a significant increase in the total GSH pool at different levels but the most beneficial effect could be observed (p3 in combination (group G) towards elevated (>39%) the above preneoplastic hepatic marker enzyme from DEN control rats were mostly showed near neutral values. In-situ, immuno localization of MT protein was observed in DEN control liver tissue (group A) showing a strong immune-reactivity in comparison to that of (group B) normal controls (Figure 2). In DEN induced tumor liver sections have high metallothionein immuno positive cells, the immune-positive cells formed contiguous foci or sheets and on some occasion’s isolated clusters of positive cells were seen. Accordingly an interesting feature of met-allothionein immune-expression was noticed here in Figure 2, which showed an intense immune-staining of metallothionein protein around the portal vein of the pre neoplastic lesions indicating its prominent focal expression along with numerous clusters of metallothionein positive foci. In comparison to carcinogen control, sections from selenium and/or 1-a-25-OH vit D3 treated rat livers (group C, E and G) showed low metalloth-ionein immune-reactivity with scattered metallothionein positive cells, however in the sections from group G rats only a few MT-positive cells was noted to that of groups C and E (figure not shown) suggesting that, combined supplementation had more pronounced effect than administrated when alone. Liver sections from the groups B, D, F and H (Control groups of A, C, E and G) did not show any detectable focal expression of metallothionein but basal expression. Immuno-staining (A, C and E) indicate met-allothionein immuno reactivity over 3 sequential time-points (i.e., at 16, 24, and 32 weeks). Two way ANOVA test showed a significant increasing trend in MT immune-reactivity ( p < 0.01) during the 3 sequential time points (Table 2) over DEN control rat liver. At same time points, animals treated with Se and/or vit D3 showed a (Firstly, significance was observed in all groups at P < 0.05 and p < 0.01. level at week 16, secondly p < 0.01 evel significance for all treatment group over normal control and insignificant result for groups E, G and H over DEN control was observed at week 24 . Finally it found that all treatment groups were beneficially significant at p < 0.01 level over DEN control at weeks 32, prominent suppressive effect on MT immune-positively when compare to DEN control. Apoptotic cells were not detected in the normal liver section. The apoptotic index (AL) ranged from 0.00% to a maximum of 3.55% in the carcinogen control groups at various time points. Few P53 immuno positive cells (0.43±0.05%) was detected in DEN liver section, whereas se and vit D3 treated section showed an increase in P53 immuno-reactivity (0.99±19%, pp3 treated rats as compared to that of DEN control. Treatment with Se and vit D3 together prominently reduced MT expression in carcinogen challenged rat liver. The exact molecular mechanism of combined effect of Se and vit D3 mediated down regulation of MT expression is not clear at the moment, but it is reveled by Chakraborty (2003) that micro-nutrients mediated restoration of tissue antioxidants may lead to elimination of reactive metabolites from the system, thereby posing low oxidative stress to the host and as a result of which MT is down regulated towards the base level . In this context, Se and vit D3 together was able to induce apoptosis in rat hepatocytes but abated the generation of DNA SSBS. The latter is a measure of oxidative DNA damage and thus an indicator of genotoxicity. So, it is clear from these studies that Se and vit D3 mediated induction of apoptotic cell death, as observed herein was not a consequent of genotoxicity induced by Se and vit D3. Thus Se and vit D3 here acting as a non-genotoxic, apoptosis-inducing agent in rat liver preneoplasia . A number of studies have demonstrated the presence of enhanced synthesis of MT in rapidly proliferating normal cells, regenerating cells and cancer cells. The study of Adbel Mageed (1998) has suggested that the nucle-ophilicity of MT to protect cells against the cytotoxic effects of electrophilic anticancer drugs . Several evidences indicate that MT has the capacity to scavenge reactive oxygen metabolite which produce endogenous antioxidants imbalance that can induce DNA damage, lipid peroxidation, enzyme oxidation etc. leading to cellular destruction, chromosomal aberrations and finally to cancer. MT was considered as a potential prognostic marker in invasive ductal carcinoma of breast, skin, cervical and pancreas. Irregular cell growth due to increased cell proliferation or failure of cells to undergo apoptosis is recognized as a major contributory factor to the malignant process . Another opinion of MT mechanism suggested by Donnelly (2000) was stable crypt-restricted immune-positive for MT. It is a recently described stem cell mutation marker for mouse colon that can be assayed in paraffin-fixed tissue sections and has been validated against the G6PD assay. MT immune-positive crypt frequency has shown a dose response to 3 different chemical mutagens that further confirmed the evidence that it is a somatic mutation marker . MT can be induced by a number of endogenous and exogenous stimuli including glucocorticoids, interferon, interleukin-1, progesterone, vit D3 endotoxins, serum factors, heavy metals, storage of metal ions and regulation of cellular zinc . MTs can function as antioxidants. It has been suggested that intracellular oxidants may play a role in anticancer drug mediated programmed cell death and it was observed that MT expression can be regulated by ambient oxygen levels. This has led to speculation that MT may be an inducible anti-apoptotic gene product . However many independent groups of investigators found direct casual relationships between MT and cancer but more pronounced role of MT among those was detoxification mechanism . This study demonstrated the Se and vit D3 mediated induction of P53 protein causing apoptosis. Se and vit D3 together is a well known pro-oxidant at high doses and continuous supplementation of Se and vit D3 together may result in the generation of free radicals that has been proposed as one of the mechanism by which this element exerts its cellular actions. Huang et al. reported that Se and vit D3 together generates endogenous H2O2 from superoxide radicals (O2) that is required for P53 transactivation and there by apoptosis . Regardless of the mechanism, based on the results reported in this study, we conclude that both Se and vit D3 could be considered potential cancer chemopreventive agents whose effect are presumably based on inhibition of growth of the neoplastic cells by coordinated regulations of different biochemical marker enzymes, studied herein. The result of histopathology and antioxidant study elicited the maximum protection of both Se and vit D3 for the entire period of study against DEN-induced hepa-tocarcinogenesis, which was reflected in the almost normal hepatocellular architecture. Regardless of the mechanism, based on the significant change in the trend of MT immune-reactivity and alteration of antioxidant level, our study has shown a considerable role of combined effect of micronutrient like Se and vit D3 in chemically induced rat hepatocarcinogenesis . Milner JA, McDonald SS, Anderson DE, Greenwald P. TOPIC OF THE REFERNCE. Nutrition Cancer 2001; 41: 1-16. Thirumoorthy N, Manisenthil Kumar KT, Sundar AS, Panayappan L, Chatterjee M. Metalloth-ionein: an overview. World J Gastroenterol 2007;13: 993-6. Margoshes M, Vallee BL. A cadmium protein from equine kidney cortex. J Am Chem Soc 1957; 79: 4813-4. Kaplan LA, Pesce AJ, Kazmierczak SC. TOPIC OF THE REFERNCE. Clinical Chemistry Mosby: 2003; 4: pp. 960-72. Chakraborty T, Samanta S, Ghosh B, Thirumoorthy N, Chatterjee M. Vanadium induces apotosis and modulates the expression of metal-lothionein, Ki-67 nuclear antigen and P53 during 2-acetylamino fluorine induced rat liver pre neoplasia. J Biochem 2005; 94: 744-62. Jin R, Bay BH, Chow VTK, Tan PH, Lin VCL. Metallothionein IE mRNA is highly expressed in estrogen receptor-negative human invasive ductal breast cancer. Br J Cancer 2000; 83: 319-23. Deng DX, Chakrabarti S, Waalkes MP, Cherian MG. Metallothionein and apoptosis in primary human hepatocellular carcinoma and metastatic carcinoma. Histopathology 1998; 32; 348–55. Chatterjee M. Vitamin D and genomic stability. Mutation Res 2001; 475: 69-88. Jayasurya A, Bay BH, Wim-Yap, NG Tan NG. Correlation of MT expression with apoptosis in nasopharyngeal carcinoma. Br J Cancer 2000; 82: 1198-203. Donnelly ET, Bardwell H, Thomas GA, Williams ED, Hoper M, Crowe P, McCluggage WG, Stevenson M., Phillips DH, Hewer A, Osborne MR, Campbell FC. MT crypt-restricted immunopositivity indices (MT CR II) correlate with aberrant crypt foci (ACF) in mouse colon. Br J Cancer 2005; 2: 2160-5. Tan Y, Sinniah R, Bay BH, Singh G. Metalloth-ionein expression and nuclear size in benign, borderline, and malignant serous ovarian tumours. J Pathol 1999; 189: 60-5. Kondo Y, Woo ES, Michalska AE, Choo KH, Lazo JS. Metallothionein null cells have increased sensitivity to anticancer drugs. Cancer Res 1995; 55: 2021-3.